Queen Sofía (Spaingie: [soˈfi.a]; Greek: Σοφία [soˈfi.a]; umwhile Princess Sophia o Greece an Denmark, born 2 November 1938) is the wife of Keeng Juan Carlos I. Sofia wis the first bairn o Keeng Paul I o Greece an his wife Queen Federica. 2 November 1938 – 14 Mey 1962 Her Ryal Highness Princess Sophia o Greece an Denmark. 14 Mey 1962 – 21 Julie 1969 Her Ryal Highness The Princess o Asturias. 21 Julie 1969 – 22 November 1975 Her Ryal Highness The Princess o Spain. 22 November 1975 – 19 Juin 2014 Her Majesty The Queen o Spain. 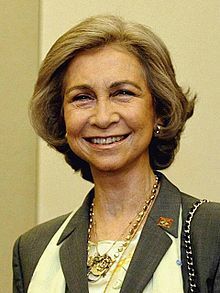 19 Juin 2014 – present Her Majesty Queen Sofía o Spain. This page wis last eeditit on 14 Apryle 2019, at 13:37.